This is the Clan Forsyth crest to the right of the page, which every Forsyth is entitled to wear. It is simple to join the extended Clan Forsyth Family Society. Membership is open to everyone with the name Forsyth, in any of its forms, as well as to those who have a Forsyth somewhere in their ancestry. All it costs is £10 per annum, and this covers the whole family. You can also gift a membership to a relative. 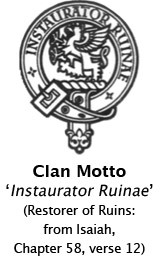 Clan Forsyth Society Certificates are available for a small extra charge to cover postage. In the UK, this is an additional £3, and it is £4 sterling equivalent for all overseas members. These handsome certificates are printed in full colour, and incorporate the Arms of the Chief, by kind permission of Forsyth of that Ilk. They are A4 size, so that they are ideal for framing and display. If you wish to order one of these, please send the name and place of residence which you wish to have inscribed on it, along with your remittance. Please fill in the Application for membership form to register your interest and send it to the address you see opposite. If you'd like any further information, please do not hesitate in contacting us.